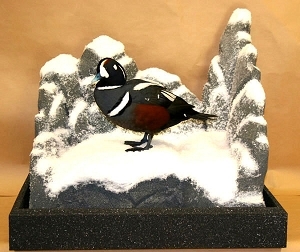 Hello and Welcome to Mounted Memories Taxidermy where waterfowl hunting is much more than a way of life, it is a passion. There are two reasons why I know this to be true. The first reason is because I have been waterfowl hunting for the last 30 years and the second, why else would I find myself up at the wee hours of the morning looking forward to braving the elements and sitting hours on end in a hole while blowing into a tube shaped gizmo trying to do my best imitation of Dr. Do Little and calling that having a good time. It’s these times we spend with friends and family waterfowl hunting that has created the fondest memories for me. It’s this inspiration why I started Mounted Memories Taxidermy to preserve those special memories for all the times to come. Mounted Memories Taxidermy is located in the beautiful mountain community of Middletown, California in northern California. I am a short drive north of the Napa, California wine country between Calistoga, California and Clear Lake, California. It is here where my waterfowl hunting first got started on Clear Lake California. I knew after my first trip afield that this was something I wanted to do for the rest of my life. It was after that when my father introduced me to California’s northern San Joaquin Valley. I found myself hunting all over the northern part of this valley in such places as Colusa Refuge in Colusa, California, Delevan Refuge in Maxwell, California and Grey lodge Refuge close to Gridley, California. We joined American Sportsman Club which took us to more places in the California valley. Soon we started heading to Northeast California to Alturas, California, Cedarville, California and even a small community of Likely, California. Soon after that we started venturing into Oregon into such towns as Klamath Falls, Oregon; Lakeview, Oregon; Rogue River Oregon and Sprague River Oregon. You could easily surmise that I had been bitten hard by the waterfowl hunting bug hard. 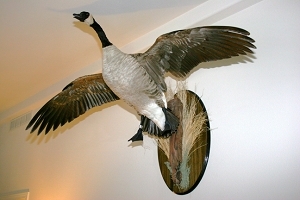 Waterfowl Taxidermy is something that has fascinated me for a long time. During those many waterfowl hunting trips with my father we would always find ourselves in restaurants and sporting good shops where there would always be waterfowl taxidermy on display. I was in awe how a moment in time could be preserved for all to see and enjoy. The artistic creativeness of the displays conjured up many a fond memory in a waterfowl blind. I also liked the idea of being able to be involved with waterfowl on a year round basis. It was then that I decided this was something that I wanted to do. In 1998 I found myself at the California Association of Taxidermists Show and Competition in Redding, California. I was there as an observer wanting to get a better understanding of this world of waterfowl taxidermy. Needless to say I was hooked from the get go. Upon my return home I read through every waterfowl taxidermy book and watched every waterfowl taxidermy video I could find. With help from a, now, very good friend, I returned to the California Association of Taxidermy Competition and Show as a competitor earning myself a first place ribbon. During the past 8 years of taxidermy competition I have become quite immersed in the taxidermy competition world winning numerous awards. I am an active member of the California Association of Taxidermists, Oregon Association of Taxidermists, Idaho Taxidermists Association and National Taxidermists Association. I have earned the ranking of Master Taxidermists in California, Oregon and Idaho and I am currently working on my National Award of Excellence. I have attended numerous state shows held in Redding California, Prineville Oregon, Boise Idaho and Pocatello Idaho. I competed in a national show held in Billings, Montana and recently I competed in the World Show held in Reno, Nevada. 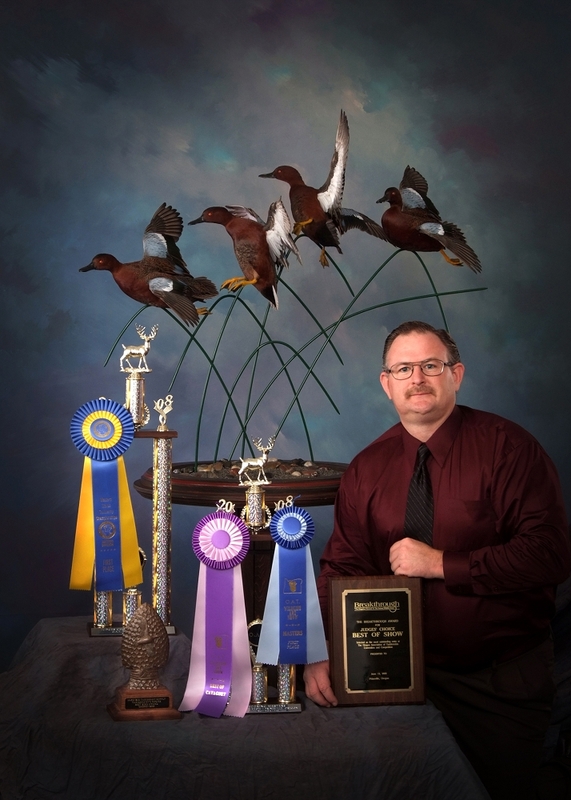 I am on the board of directors for the Oregon Association of Taxidermists and have also taught several classes at my shop and presented several seminars at the state taxidermy competitions. The world of waterfowl taxidermy competition has been a phenomenal learning experience. I am constantly striving to improve my skills learning new and better ways to preserve those special memories. I have attended numerous seminars learning about new products and how to use them so I can bring it back to my shop for your benefit. This results in the most up to date and most life like waterfowl taxidermy that mounted memories can provide. Thank you again for stopping by and please enjoy!